Taking care of fall mums as perennials is a great way to extend your garden's peak well beyond the range of more tender flowers. Garden chrysanthemums, affectionately known as fall mums or hardy mums, continue to give your garden a splash of cheerful color well into the cooler months at a time when the rest of your flowers are winding down. Caring for mums as perennials may be a bit more work than simply buying new potted plants each year, but it is far more rewarding. 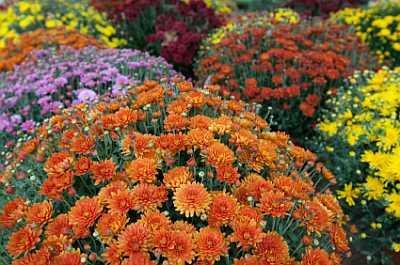 With a good microclimate, fall mums can do well in all but the most extreme environments, typically growing as perennials between planting zones three and nine. The key to achieving chrysanthemum success is to choose your cultivar wisely. Particularly if you live in the colder regions, avoid buying potted fall mums at florist shops or department store garden centers. These mums may have been chosen for their lovely color or low price rather than their suitability for Northern gardens. If at all possible, order your mums in the spring from a garden catalog or in person from a specialty garden center, and look specifically for plants intended for your climatic zone. Spring planting is preferable, but as long as you get them in the garden at least six weeks before your regions first hard frost, there should be time for your flowers to put down sufficient roots and harden off for winter. If you want to treat your mums as perennials you really need to give them almost year-round care. Not constant attention necessarily, but a little tender loving care every now and then. Place the root ball in the hole, and fill in the remaining space with a nice loamy topsoil or equal mixture of peat, compost and vermiculite. Firm the soil around the base of the plant. A good thick layer of straw, shredded leaves or other mulch will insulate the soil somewhat and protect your mums from standing in water, which may freeze and damage the tender roots over winter. Throughout the growing season, prune your chrysanthemums lightly by pinching off the buds from the end of growing shoots to encourage lateral growth, creating a thicker, fuller plant with an abundance of flowers. Continue doing this right up until cool weather sets in, at which time the extra plant matter will have a much-needed sheltering effect on your plant. Feed your fall mums monthly from early spring until late July. New foliage needs a certain amount of time to harden off for frost protection, so any growth after July is unlikely to survive the winter. Keep the soil around your mums moist at all times, never allowing them to dry out and wilt. Continue watering throughout the fall until all the foliage has died back for winter. Once the foliage has died back, trim the dead stems back to ground level with a pair of garden shears and mulch to a depth of three to four inches as part of your fall garden cleanup. Water your chrysanthemum roots regularly in the spring, and soon you will see new green shoots poking up from the trimmed back old stems. Throughout the spring and mid-summer, trim your mums back roughly one inch for every five inches of growth. This will create a thick, bushy plant that will produce an overwhelming display of fall flowers just as your other garden flowers begin to fade. It may seem like a bit of extra work, but the few moments you take now and then for care of fall mums will reward you tenfold when you get to enjoy the beauty and splendor of a truly lovely fall display.